Objectives. 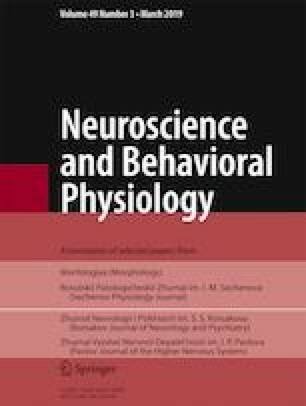 To determine the location, percentage composition, and morphometric properties of sympathetic preganglionic neurons containing NO synthase (NOS) in the spinal cord in rats. Materials and methods. Studies were performed on 35 white female Wistar rats aged 3, 10, 20, 30, and 60 days, six months, and three years. Spinal cord sections made at the level of segment T2 were used for immunohistochemical detection of NOS and the acetylcholine-synthesizing enzyme choline acetyltransferase (CAT). The areas of nerve cells and the proportions of immunoreactive neurons were determined. Results. Most sympathetic preganglionic neurons in the spinal cords of neonatal and 10-day-old rats contained NOS and also CAT. Rats of these age groups also contained a population of NOS-positive/CAT-negative neurons (26% in neonates and 8% in 10-day-old animals), which was not seen in older animals. During the first 20 days, the proportion of NOS-immunopositive neurons decreased significantly, while that of CAT-positive neurons increased. Conclusions. In early postnatal ontogeny there was a decrease in the number of sympathetic preganglionic neurons expressing NOS, which may have influences on the mechanisms of NO-ergic sympathetic transmission. Translated from Morfologiya, Vol. 153, No. 1, pp. 23–27, January–February, 2018.